Every two years, and at other times in between, candidates for political office and an entourage of supporters, handlers, and journalists are said to go "on the stump," or simply "stumping." It seems like a rather unattractive word to refer to a core activity of political campaigning  traveling from place to place making speeches in front of live audiences. For some, it might conjure images of frustration or confusion as when someone is stumped, or baffled into silence or inaction. Not a good thing to do if you wish to win popular support for your candidacy. Both meanings of the verb "to stump" share a common distant reference: the noun "stump," derived from Middle English (stumpe) and Middle Low German (stump), referring to the part remaining after a tree or branch has been cut or removed. To successfully frustrate, or to stump, someone is thought to derive from the tendency of stumps to cause people to, well, "stumble" over them (from Middle English stumpen, to stumble, as if over a tree stump). The political activity of going on the stump or stumping, by contrast, gives the often maligned stump a more dignified role in society, perhaps even an essential role in a vibrant democracy. 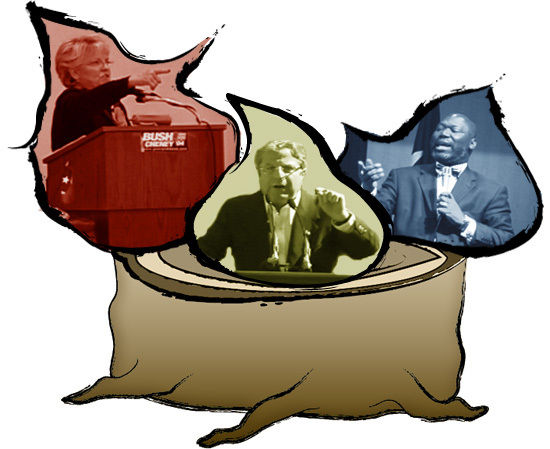 Instead of hobbling or impeding a person, the political stump  the remaining portion of a felled tree  uplifts and supports political candidates in their efforts to communicate to the community. Of course, that was in the old days before public address systems, auditoriums, and teleprompters, when the most common way to be heard was to stand on that most common and immovable object, the tree stump. Well, that's the idea anyway. In practice political stumping (and giving stump speeches) may cause citizens to be truly stumped or confused about what a candidate really stands for. On the stump or on the hustings? Centuries ago rulers might convene a husthing, usually composed only of members of the immediate royal household as opposed to a larger popular assembly of constituents, in order to gather advice or issue decrees. The English later adapted the word as husting to refer to the senior court of the City of London, and later narrowed the meaning to refer to the physical platform in that court where the Lord Mayor sat. Over time this last meaning was generalized to refer to any platform from which political candidates might address their audience, and more commonly today it refers to "the campaign trail," which we also know as "the stump." Notably, husting usually appears in modern English only in the plural form hustings, and then usually in the phrase "on the hustings." Full Source: The Word Detective, http://www.word-detective.com/081100.html.